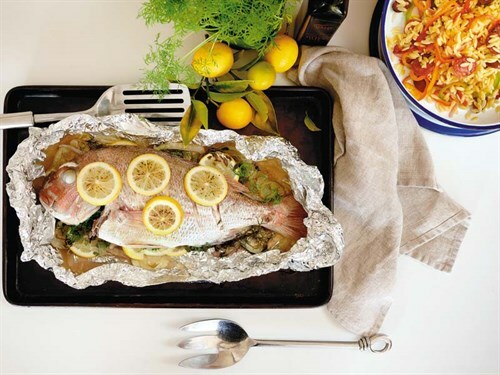 Check out this fennel and lemon baked whole snapper recipe by Masterchef NZ runners up Nikki and Jordan Shearer. This is a very rustic dish, just go with your instincts and be generous with all of the ingredients. This is great cooked on a barbecue with the hood closed on medium-high or in the oven at 180°C. To serve, unwrap snapper on a chopping board or platter and garnish with more freshly chopped herbs and slices of lemon. Be careful of the bones when demolishing. Heat barbecue or turn oven to 180°C. Layer sliced red onion, fennel, half of the ginger and half of the herbs on a large sheet of tin foil on a flat surface (you may have to fold 2 sheets together depending on the size of the snapper). Stuff cavity of the snapper with remaining ginger, 4-6 slices of lemon and the rest of the herbs. Place the remaining sliced lemon on top of the snapper, and drizzle first with fish sauce and then with flavoured oil. Enclose the fish by folding or scrunching the tin foil together, ensuring it is secure. Bake for approximately 30 minutes, or until fish is just cooked. You can check this by carefully opening the foil and opening the fish at its cavity. Allow fish to rest in closed tinfoil for 5 minutes before serving to finish off the cooking. Check out Grandma Tui’s oyster soup recipe.